Getting the most out of video on your Note II is pretty simple, if you make sure to download a few of the following top 10 video apps we've carefully selected from the Google Play store. With its speedy quad-core processor, 5.5-inch HD Super AMOLED display and superb camera, the Note II is perfectly suited to would-be Spielbergs and Scorseses, wanting to shoot life on the move and create art from their mobile home movie footage. Check out the following list of the cream of the very finest 10 video players and editing tools to help you get the very best out of that beautiful HD Super AMOLED display on the mobile movie maverick that is the Samsung GALAXY Note II. The Samsung Note II's in-built video player and video editing features are hugely impressive in their own right, of course. 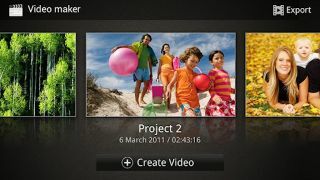 Plus, most users' first port of call if they want to download a movie will be Samsung's own Video Hub. That said, in addition to those, what follows is our selection of the ten best video apps out there. There is nothing like editing a mini movie out of the video you have shot on your Samsung GALAXY Note II... except getting an app to do all the hard work for you. Magisto – Magical Video Editor is a free video tool that will take any footage you have got stored on your device and create a fantastic mini movie out of it. All you need to do is select the clips you want to use, choose the music you want to use – there's a variety on offer including the latest chart hits – and give your blockbuster a title. It will take a few minutes to auto edit but the results are more than worth it. Highlights are called highlights for a reason – they are the best bits, the things that you skip to whenever you are showing someone something. HighlightCam Social is an app that focuses on the best bits of your video skills. The app analyses footage you have shot on your GALAXY Note II and puts together a sizzle-reel for all to enjoy. You can give the app a few hints as to what you want – whether you want highlights based on speech, action or people – and then you let HighlightCam do the rest. The app is free for the first 10 goes, offering a fantastic way to sift through your Note II's content and make it presentable! Animoto is another fantastic way to auto-generate movies from the content you have shot on the GALAXY Note II. The app will find content on your device – and bearing in mind with the Note II's capacious memory there could well be a lot – and creates a video for you to play around with. If you don't like a clip chosen, then you can rearrange, choose music and even give your video a title. There is a limit on the free version, but the app offers so much to entice your inner Scorsese that it will tempt you to buy its full-fat brethren. WeVideo is all about sharing the great movies you have created using your Note II. It allows you to edit content, create visceral shorts and then share them to whichever social network you are linked into. You can add some effects, any music you may have on your device and there's a heap of effects to try out as well. And if you are worried that your opus is taking up too much space, then you can upload your video to the cloud as well – freeing up space for your next Oscar-worthy jaunt.